Wedding & Honeymoon Aeolian islands, amalfi coast, apulia, Capri, honeymoon destinations in Italy, Lecce, Palermo, romantic Italy, sicily, trulli. permalink. Picturesque countryside, charming historic villages, boutique hotels, idyllic seaside destinations, fabulous restaurants. 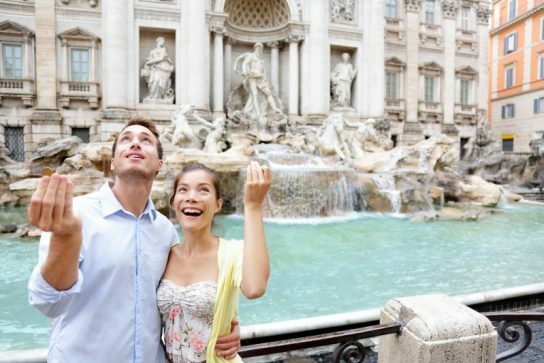 Isn’t Italy just the perfect destination for newly-married couples? 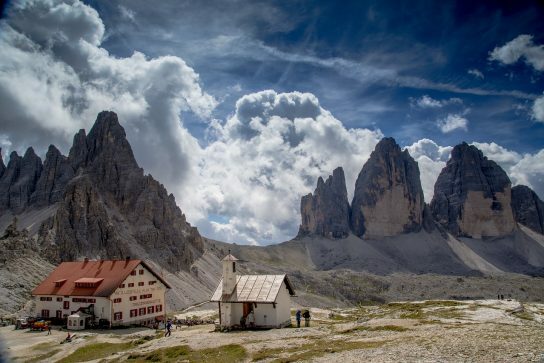 We think it is and, to help you plan your memorable first trip as a married couple, we take a look at some of the best honeymoon destinations in Italy, with recommendations on places to stay and fun things to do together. Sunset view of Positano village at Amalfi Coast, Italy. Along the southern edge of the Sorrentine Peninsula in the southern Italian region of Campania is a 50-kilometer stretch of rugged coastline, dotted with beautiful beach coves, pastel-colored fishing villages, grand villas, terraced vineyards and cliff-side lemon groves: the world-famous Amalfi Coast. 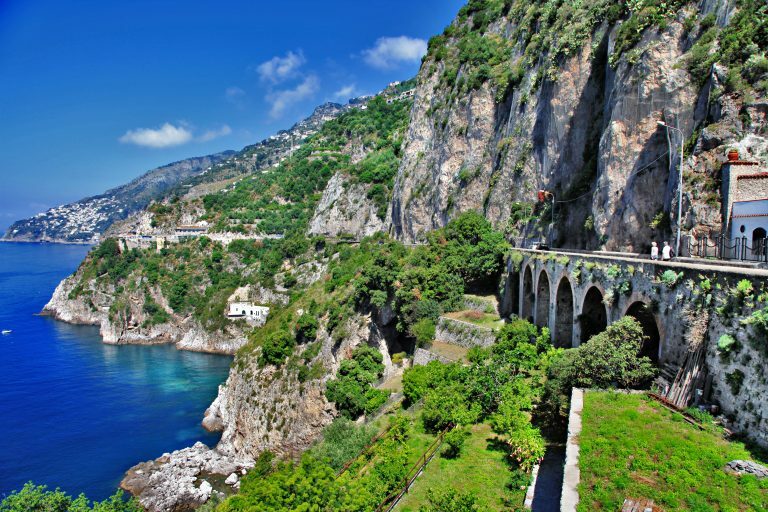 There is no doubt that the Amalfi Coast is among the top honeymoon destinations in Italy. To treat yourself – as you should – to a romantic and luxurious stay, check in at the 5-star Hotel Le Sirenuse in Positano. This historic property was once the summer home of the Marchesi Sersale, who, in 1951, converted it into a family-run hotel, decorated with old master paintings from the noble family’s collection and rare tropical plants. The Aveda Concept Spa, designed by the world-renowned architect Gae Aulenti, provides the perfect atmosphere for rejuvenation – and for getting pampered together. Love swimming? Try the heated outdoor pool. Most rooms at Hotel Le Sirenuse have a private terrace or balcony overlooking the Bay of Positano, ideal to sit down at the end of the day while sipping a glass of wine. A great way to cement memories is to share experiences together, and, being in Italy, food and wine are a major part of the experience: in this case, immerse yourself in the tastes and culinary traditions of the Amalfi Coast with a small group wine tasting and seafood cooking class, held in the house of a local family – one of the first to be built in Positano – who will teach you how to prepare some typical Mediterranean dishes and how to pair them with wine. 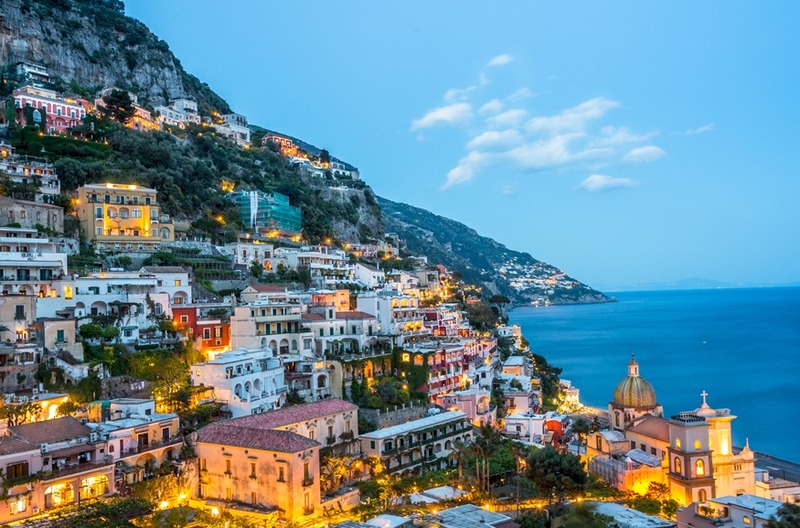 Fabled Capri is a must-see on any trip to the Amalfi Coast, and there is no better way to experience its charms than from the sea – preferably from your own private yacht! You can even choose the vessel you prefer. On the way to Capri from Positano, you will retrace the journey of Ulysses who, seduced by the song of the sirens, landed on the enchanted little islands of Li Galli. Then, your captain will sail toward Capri’s most famous symbol, I Faraglioni, and continue to the blue-green waters of the Green Grotto and the Blue Grotto, the famous Villa Tiberio and the traditional ports of Marina Grande and Marina Piccola. 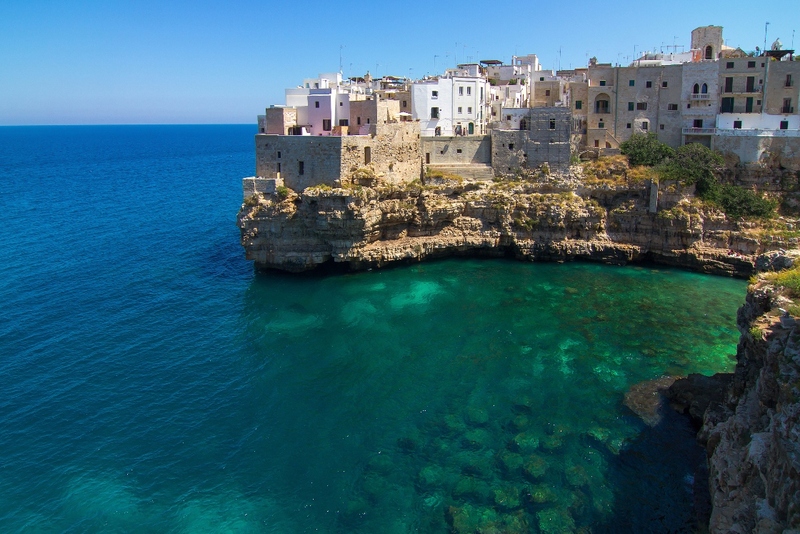 The southern region of Puglia, which forms the heel of Italy’s “boot,” has recently become one of the most sought-after honeymoon destinations in Italy. Known for its whitewashed towns, centuries-old farmland and hundreds of kilometers of gorgeous coastline, Puglia has plenty of romance to offer. 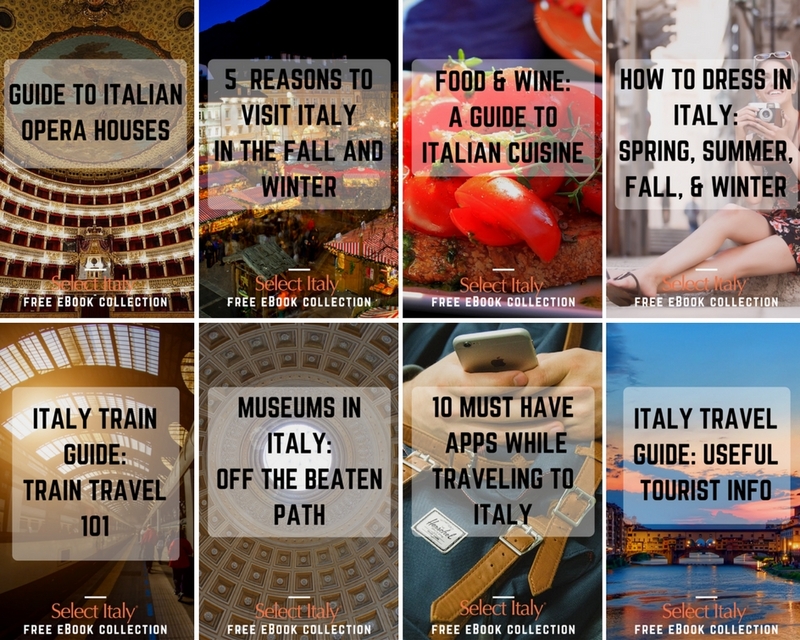 Some of its highlights include Lecce, nicknamed the “Florence of the South” for its Baroque architecture, and Alberobello and the Itria Valley, home to “trulli,” stone huts with distinctive conical roofs. A great base to explore the region is the stylish five-star relais Don Ferrante, a small (only ten rooms) boutique hotel located in the little seaside town of Monopoli. Housed in what used to be a fortress rising from the city walls next to the castle, the structure has been completely renovated respecting the architectural rules of the Middle Ages, using typical local stone and cocciopesto (crushed pottery). Picture yourself on the wonderful terrace overlooking the sea at sunset, cuddled up to your sweet half, and there you have your perfect romantic moment! With its Baroque churches and palaces, Lecce reels in romance at every corner. Explore the town on a half-day guided walking tour; highlights include the Basilica of Santa Croce, the triumph of Baroque art in Lecce; Piazza Sant’Oronzo, the most important in Lecce , featuring an ancient Roman amphitheater and a tall Corinthian column supporting the statue of St. Orontius; and Piazza Duomo, site of the Cathedral. The unique town of Alberobello, with its famous trulli, makes for a fun day outing; combine with a taste of the local cuisine and you have a signature Apulian experience. The Tour and Taste Alberobello Tour includes a guided visit to learn about the history of the ingenious trulli, followed by a brief cooking class and lunch in a typical masseria in the countryside. 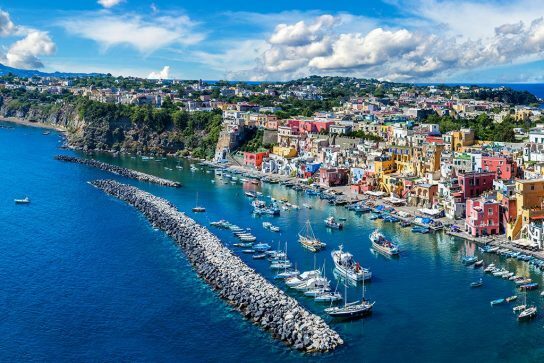 Sicily, the largest Mediterranean island, eternal crossroads of cultures, keeps seducing travelers with its rich history, diversity of landscapes, pristine waters and delicious fresh food. For these reasons, and more, Sicily is one of the best honeymoon destinations in Italy. 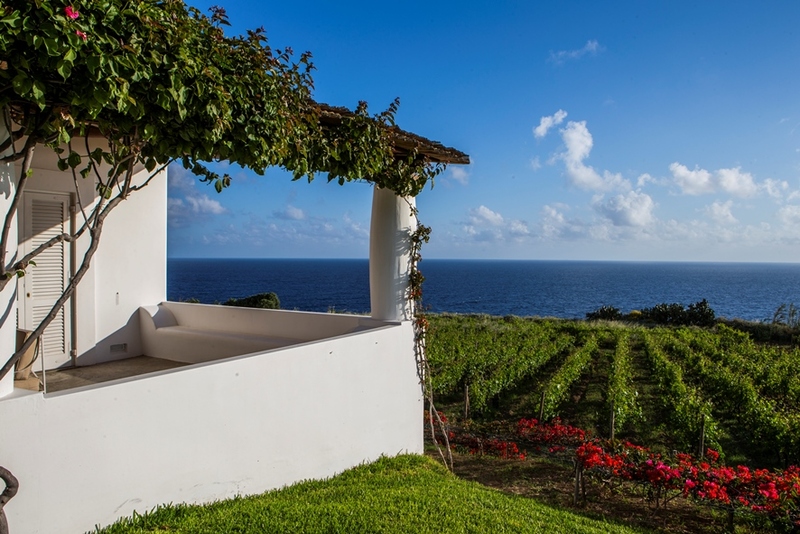 When on a honeymoon, you may be looking for solitude and privacy: head to the remote Aeolian islands, a volcanic archipelago off the northern coast of Sicily and check in at the Capofaro Malvasia Resort on Salina, an oasis of peace dominated by the deep blue of the Mediterranean sea and the harmonious green of the vineyards where the Malvasia delle Lipari grape is grown. Inspired by Mediterranean traditions, this 5-star resort offers the ultimate Italian beach experience with an enogastronomic twist. Here, you can relax by the freshwater pool, get a massage in the pine-shaded relaxation area, enjoy a spa treatment and try the local delicacies at the resort’s restaurant, whose menu is based chiefly on island produce, the day’s catch and carefully selected artisan products. When you are ready to get back into the hustle and bustle of a major city, head to Palermo, Sicily’s capital. Dominated by the Phoenicians, Greeks, Carthaginians, Romans, Saracens, Normans, Spanish and the Kingdom of Naples, Palermo boasts an incredible history, which you can discover on a guided tour of the city’s masterpieces. Then head out of town to learn about the winemaking traditions of the area just outside Palermo, where you can taste such great wines as Grillo, Nero d’Avola and Gorgo del Drago. Cheers to your honeymoon trip to Italy!